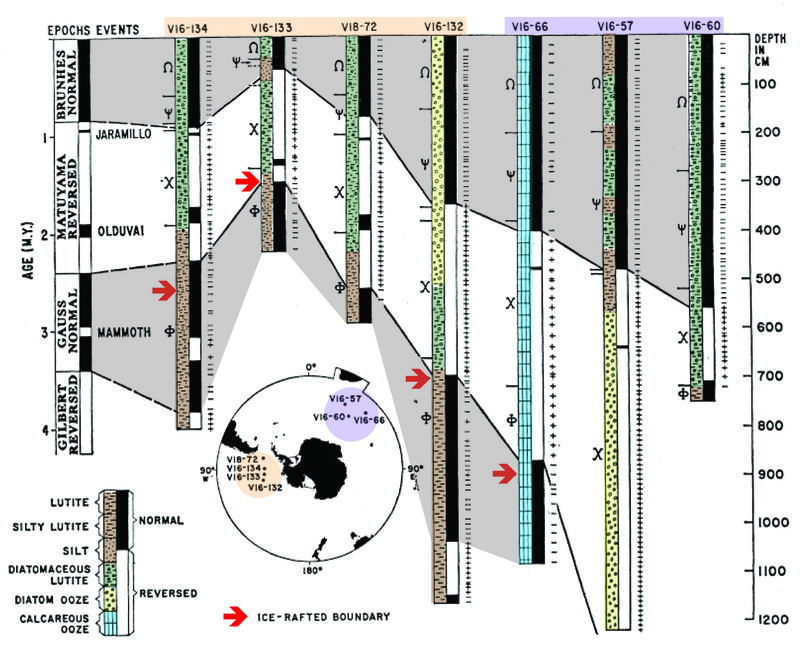 The power of magnetic stratigraphy was recognized in the early 1960s when researchers began to pair K/Ar radiometric dates with paleomagnetic measurements of volcanic rocks from around the world, developing the first Geomagnetic Polarity Timescale. The Geomagnetic Polarity Timescale assigned age ranges for periods of ‘Normal’ or ‘Reversed’ polarity, or when the magnetic field was oriented like today (Magnetic North Pole near the Geographic North Pole) or opposite to how it is today (Magnetic North Pole near the Geographic South Pole). The earliest applications showed this new timescale could be used to assign spreading rates to mid-ocean ridges though comparison of oceanic crust magnetic anomalies and ages to sediment cores through comparison to the sediment’s natural remanent magnetization (Figure 1). These studies provided new insight to the emerging fields of plate tectonics and paleoceanography by allowing more direct comparison between what had previously been considered disparate geologic archives. The OSU P-mag lab uses magnetic stratigraphy on a range of timescales to assess the stratigraphy of and assign chronology to sedimentary archives. We have highlighted a few examples of our work in the following sections. The last magnetic reversal occurred around 774 thousand years ago, but the geomagnetic field has experienced considerable change since then in its intensity and morphology. Proxies for Relative Paleointensity (RPI) to estimate past relative changes in field strength can be created through the normalization of a sediment’s NRM intensity (sensitive to field intensity and lithologic variations) by a laboratory induced magnetization intensity (sensitive to lithologic variations only). RPI stratigraphy can be used to make regional or global correlations of sediment cores depending on the timescales of interest and data quality. RPI is particularly useful for sediment cores that are challenging to date with more commonly used stratigraphic methods, like oxygen isotopes, or can be used in tandem with other stratigraphic methods to provide an additional constraint. 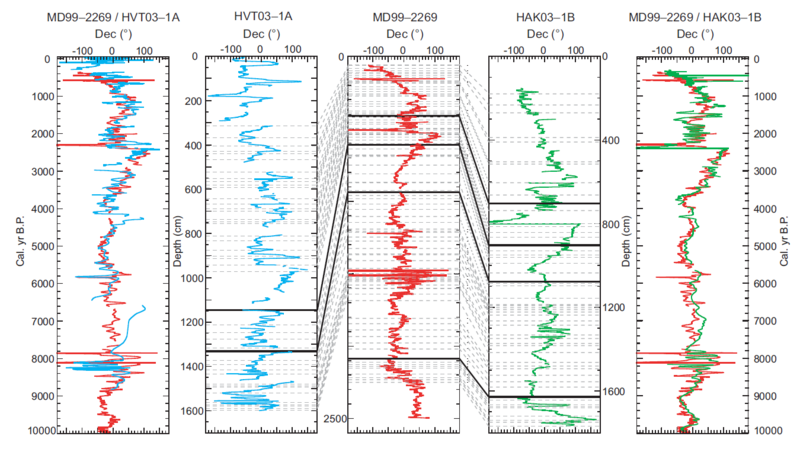 For example, in 2016 Rob Hatfield, Joe Stoner, and colleagues used RPI stratigraphy to better constrain the timing of Marine Isotope Stages 9 and 10 in the Eirik Ridge core MD99-2227 in the Northern North Atlantic (Figure 3). Around this transition foraminifera are scarce and a continuous oxygen isotope record cannot be created. The RPI signal reconstructed from MD99-2227 was compared to the better dated ODP Site 983 to establish a stronger chronology through this interval. In addition to intensity changes, sediments can record past directional changes in Earth’s magnetic’s field, or Paleosecular Variation (PSV). These changes are described by the declination and inclination of the magnetic vector. In high accumulation rate sediments, PSV stratigraphy can be useful for regional stratigraphic correlation using their common geomagnetic signal. In 2013, Sædís Ólafsdóttir, Joe Stoner, and colleagues used PSV Stratigraphy to synchronize Holocene lacustrine and marine sediment cores from Iceland. Very high resolution marine core MD99-2269 from the North Iceland Shelf has a strong chronology based on 44 radiocarbon dates with marine reservoir ages assessed through tephra correlations. Comparison of declination changes with sediment cores from two Icelandic Lakes, Haukadalsvatn and Hvítárvatn, allowed for a detailed reconstruction of sediment accumulation rates at each site. The results indicate a similar history of high sediment accumulation rate periods in the two lake basins, suggesting changes in the depositional history of each basin were driven by common changes in the regional paleoenvironmental conditions. Figure 1. In 1966, Neil Opdyke and colleagues published a study where they measured the Natural Remanent Magnetization (NRM) of sediment cores from the Southern Ocean. They found the magnetic polarity pattern of the sediment cores closely matched the pattern recently reconstructed from volcanic rocks used to create the Geomagnetic Polarity Timescale. This allowed them to import the K/Ar radiometric age estimates of each reversal to the deep sea and make connections between past environmental changes in different sectors of the Southern Ocean. The original study was published in Science and can be found here. Figure 2. Inclination of sediment cores recovered during IODP Expedition 303 at Site U1306 measured using the JOIDES Resolution long-core Superconducting Rock Magnetometer (SRM). (Left) Sediment cores were recovered by offset Advanced Piston Coring in four different holes. Each core is about 9.5 m in length and offset coring allows for complete recovery of the stratigraphy. (Right) Inclination variations are used to assign ages through comparison to the Geomagnetic Polarity Timescale (GPTS). Positive inclinations indicate periods of normal polarity (black shading on GPTS) and negative inclinations indicate periods of reversed polarity (white shading on GPTS). Figure 3. 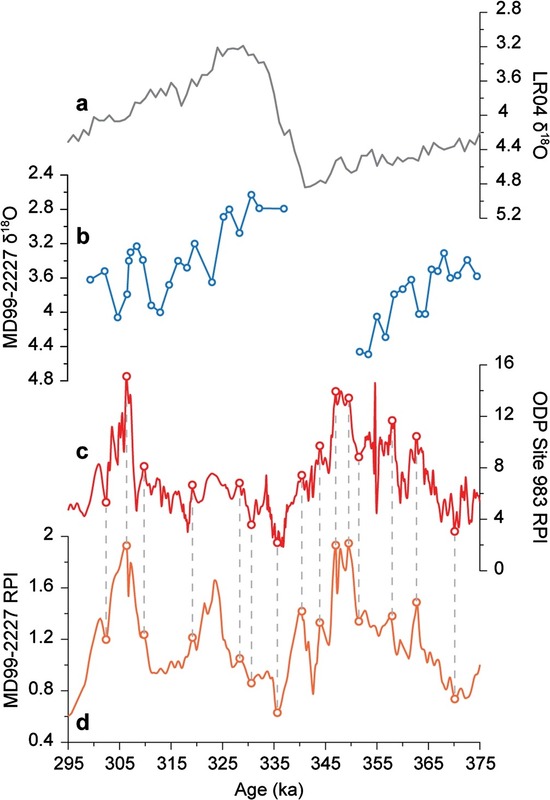 Relative Paleointensity (RPI) stratigraphy was used by Rob Hatfield and colleagues in 2016 to improve the age model of MD99-2227 on the Eirik Ridge, Northern North Atlantic during the transition from glacial MIS10 to interglacial MIS9 through comparison to ODP Site 983. Foraminifera are scare during this transition, so it would be impossible to used oxygen isotopes alone to define this transition. The study was published in Earth and Planetary Science Letters and can be found here. Figure 4. Synchronizing two Icelandic lake sediment cores to high resolution and well-dated marine core MD99-2269 using declination changes. Sædís Ólafsdóttir and colleagues in 2013 were able to use these correlations to reconstruct sediment accumulation rate histories in each lake basin at higher resolution than would be possible using the tephra age-control points available in the lake sediments alone. The study was published in Geology and can be found here. 104 CEOAS Admin Building, OSU, Corvallis, Oregon, 97331, USA.